In Mine Dasher Game, You Have To Run On Blocks And Reach To Final Point Of The Path. Stay In One Line, If You Go Off The Path, Game Will Be Over. Game Play – Simple One Touch Game Play. 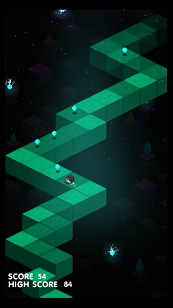 Game Controls – Tap Above To Move Straight, Tap Right Or Left To Choose Direction. The More You Run The Better Your Score Will Be. Collect The Crystals. You Can Watch Video Ad To Move Further From That Point Where Your Game Over. To Remove Ads You Have To Pay Some Bucks. Mine Dasher Game Comes With Classic Design, Lots Of Levels, And Hours Of Game Play. You Can Play This Game Offline To Get Rid Of Those Ads. Price – Free(Contains Ads, In-App Purchase), Download – Here. Size – Under 7 MB. It’s A Great Time Killer Game For Android.